Pypes Violator Dual Exhaust Black Tips 06-14 Dodge Charger SRT8 11-14 Dodge Charger 6.4L Pypes Violator Dual Black Tips Exhaust Kit, 06-10 Dodge Charger 6.1L Pypes Violator Dual Black Tips Exhaust Kit, 11-14 Dodge Charger 6.4L Exhaust System, 06-10 Dodge Charger 6.1L Exhaust System, Dodge Charger 6.4L Pypes Exhaust, [Pypes SMC11VB Exhaust Kit] - $619.95 : 3rd Strike Performance, Your Source for Late Model MOPAR Performance Parts and Accessories! Built to outflow and outlast factory exhausts, Pypes Violator dual systems feature mandrel-bent, 16-gauge, stainless steel pipe and precision-matched stainless steel Violator mufflers. These mufflers flow as much air as the Race Pro mufflers but have an incredibly unique and aggressive sound—the result of an internal louvered tube with sound deflector chambers. If you want to be noticed, these are your mufflers! 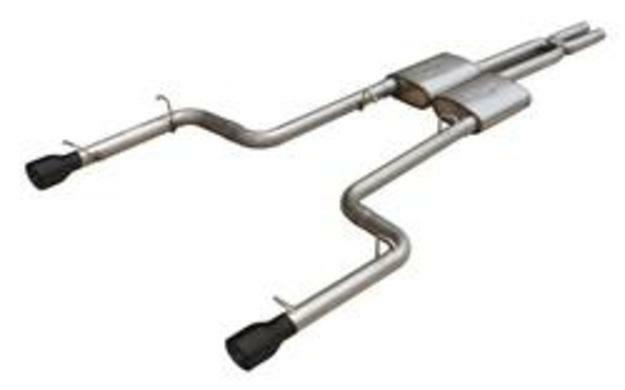 Pypes exhaust systems include stainless steel or cadmium plated hangers, clamps, and instructions; and they have slip-fit connections for a fast and trouble-free installation (some cutting may be required). Order the model designed for your vehicle.